When you hire a Columbus Culinary graduate, you can feel confident that he or she has been taught the necessary culinary skills needed for a successful culinary career. We can help put you in touch with current students and graduates who would be suited for your company. All of our associate degree graduates have completed an 8-week externship. We are always looking for new and challenging extern sites as well. If you currently have job openings that you would like to recruit Columbus Culinary students for or are interested in being an extern site, please call the Culinary Career Services Department at 877-506-5006. 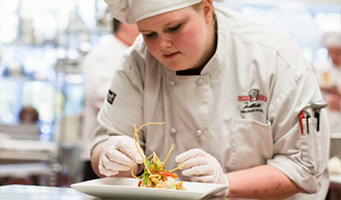 Feel Confident Hiring a Columbus Culinary Graduate! Columbus Culinary Institute graduates learn the skills needed both in and out of the kitchen, including employee management, dining room services, nutrition, and safety.